Limited Parking with extra charge. 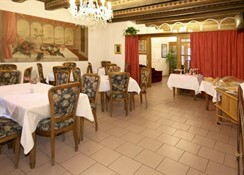 Romantic hotel Red Lion is located in a historical burgher house from the 15th century in the very centre of Prague. 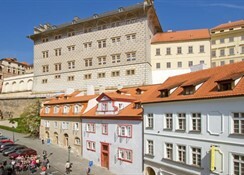 It lies directly on the Royal Route, only few minutes from the Prague Castle and Charles Bridge. All rooms have an fantastic view of Petrín, the Royal Route and the roofs of Malá Strana (Lesser Side) underneath the Prague Castle. They are equipped by historical furniture. 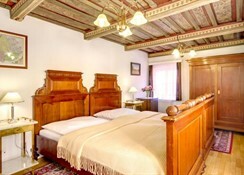 In some rooms you will find the original painted wooden ceilings dating back to the 17th century. 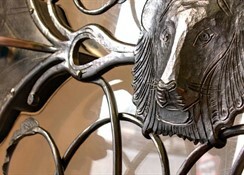 Comfortably equipped rooms with original antique and historical furniture with castle view. Bathroom (shower or bath, WC). Satellite television, Telephone, Hair-dryer, In-room safe deposit free of charge, Minibar, Tea and coffee making facilities free of charge, Sewing kit, Toiletries free of charge.